In his new book Renewable, science writer Jeremy Shere offers a fascinating history of renewable energy in the United States, and a look toward its future. In this excerpt, he tells the almost-forgotten story of how President Jimmy Carter tried to make the White House run on solar power. On June 20, 1979, the White House press corps filed up a back stairway, through an unmarked door, and onto the roof of the West Wing. It was a bright, sunny day, causing reporters from The New York Times, The Washington Post, The Wall Street Journal, and other major newspapers and media outlets to squint as they found seats, shielding their eyes with handouts that had been placed earlier on folding chairs facing the familiar presidential podium. The handouts described, in impressive technical detail, the specifications and inner working of the strange objects looming behind the lectern: a row of several large thermal solar collectors bolted to the roof, slanted at a roughly forty-five degree angle to the sun blazing overhead. As their eyes adjusted to the outdoor glare, the reporters gaped at the apparatus. Most had read about solar energy, which had gotten a lot of media play ever since the Arab oil embargo against the United States in 1973 and the Iranian revolution of 1979 had kicked off what would be a nearly decade-long energy crisis. But for many of the journalists on the White House roof that June day, this was their first close-up look at a solar panel. And at twelve feet by six feet, the steel- framed, glass- covered slabs were a sight to behold. As the briefing materials explained, the panels were thermal solar collectors used to heat water for the White House staff mess. Rods inside the collectors carried sun-heated water to a storage tank in the White House basement, from which hot water could be drawn as needed. Water-heating solar panels had been around for decades, but adding them to the White House — that was a bold move and a big story. The journalists chatted animatedly among themselves, trading theories on how Carter would use the panels to jump-start his solar energy initiative, which had been in the works for months. Moments later, the reporters straightened in their seats, readying notebooks, pens, and tape recorders as White House press secretary Jody Powell introduced the president. Standing behind the familiar microphone- topped lectern, Carter appeared worn, his light brown, salt- and- pepper hair noticeably saltier than it had been at the beginning of his term. It had been a trying three years since his triumphant election in 1976. The only recently concluded debacle in Vietnam, inflation, the energy crunch, gas lines— all had taken a toll on the American psyche and weakened the United States' standing as a global superpower. Despite Carter's best efforts at reinforcing the national backbone, his speeches and televised fireside chats proposing solutions to America's daunting energy problems failed to dispel a general malaise blanketing the country. America was on the wane, it seemed, beholden to OPEC's capricious masters. But as Carter stood before the press corps with the newly installed panels at his back, the president had a new sense of purpose. After all the dire warnings about dependency on foreign oil and the need to cut back and consume less, here, finally, was some good news. The White House solar installation was a symbolic but nevertheless concrete illustration of American know-how and ingenuity— the very things, Carter and many supporters hoped, that would lead the United States to a brighter and more secure energy future. "No one can ever embargo the sun or interrupt its delivery to us," the president told the press, injecting as much conviction as he could into his lilting Georgian drawl. "A generation from now, this solar heater can either be a curiosity, a museum piece, an example of a road not taken, or it can be a small part of one of the greatest and most exciting adventures ever undertaken by the American people; harnessing the power of the Sun to enrich our lives as we move away from our crippling dependence on foreign oil." Comparing himself to the country's twenty- third president, Benjamin Harrison, who in 1891 became the first commander in chief to have electric lighting installed in the White House, Carter hoped that his demonstration of faith in solar energy would help spark widespread use of the technology. 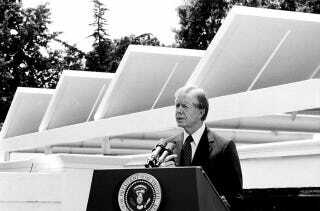 As the reporters scribbled furiously in their notebooks, Carter outlined a solar- powered future. He would ask Congress to approve a $100 million "solar energy bank" with the goal of generating 20 percent of U.S. power from alternative energy sources (i.e., not Middle East oil) by 2000. To fund this ambitious plan, Carter said, he would urge Congress to pass a "windfall profits" tax on the domestic oil industry and approve subsidies to encourage contractors to install solar panels on new and existing buildings. After his speech, Carter invited the reporters to take a closer look at the solar panels. Showing off the hardware, Carter was clearly in his element. A trained scientist with a bachelor of science from the U.S. Naval Academy and graduate work in nuclear physics, Carter was interested in how things worked and fascinated by cutting- edge technology. The media were duly impressed. The next day's papers were generally supportive of Carter's solar initiative, and even the handful of critical editorials were ultimately favorable, harping on the need for the president to do even more to encourage solar power and other forms of renewable energy. It was, for once, a moment of hope in Jimmy Carter's often-beleaguered presidency. But in the end, it was only a moment— and a fleeting one at that. Less than four months later, on November 4, an Islamist militant group, Imam's Disciples, stormed the American embassy in Iran, taking more than sixty Americans hostage. By April 1980, a high- risk rescue mission's spectacular failure helped doom Carter's reelection bid, and with it any hope for the solar bank plan. Today, more than three decades since Jimmy Carter showed off his prized White House solar panels, his warning that they could become a curiosity and a museum piece has literally come to pass. One of the panels is now on display at the Carter Presidential Library and Museum in Atlanta. In 2013, solar energy currently contributes less than 1 percent of power consumed in the United States each year, and even less worldwide. Outside of particularly sunny regions of the country, such as Southern California, and ecologically minded cities such as Boulder, Colorado, homes and businesses with solar panels are rare exceptions. While large solar farms have sprouted at an impressive clip in dozens of countries, including Germany, Spain, and China, solar energy still accounts for a very small percentage of those countries' electricity generation. And so, it's tempting to conclude not only that solar energy has not blossomed to the extent Carter envisioned in 1979 but that it's essentially failed as a viable source of energy. Tempting but inaccurate. Over the past quarter century solar energy has experienced astonishing growth around the world. According to Solarbuzz, an industry consulting group, in 1985 there was annual global demand for only around 21 megawatts of photovoltaic (PV) solar panels. Since then, demand has grown steadily, culminating in nearly 69,000 megawatts of solar capacity installed worldwide by the end of 2011. In other words, the solar industry has become an established, if still relatively small, player in the energy business, with $136 billion invested in solar energy in 2011. (The United States was the leading investor, pouring $56 billion into solar; China a distant second at $47.4 billion.) Due to increased demand, solar energy has gotten progressively cheaper, with prices for PV panels decreasing dramatically each year for the past several years. Solar technology, meanwhile, is in the midst of a renaissance. Although solar energy research continued throughout the 1980s and 1990s, a lack of funding and anemic general interest relegated solar to the margins. But during the past decade, spurred by growing concern over climate change, mounting evidence of waning supplies of fossil fuels, and high gas prices, solar energy research has been reinvigorated. Scientists and engineers around the world have made significant advances in the percentage of sunlight that solar cells convert into electricity (now averaging around 20 percent for commercial, crystal silicon–based solar panels and approaching 50 percent for experimental prototypes), next- generation "thin- film" solar cells printed on flexible sheets of plastic and metal, concentrating solar devices (using mirrors and lenses to focus sunlight on solar cells or boilers), and many other areas of solar technology. The manufacturing and installation of solar panels, too, has evolved to an industry able to churn out, ship, and install millions of units every year. Compared to where solar was in the late 1970s, the momentum it's gained in the past several years would have astonished Jimmy Carter circa 1979. Solar energy has achieved an astonishing and unprecedented degree of technological sophistication and industrial growth. Simply put, never since the advent of fossil fuels a few centuries back has solar played such a prominent and potentially game- changing role as it does today. From RENEWABLE: The World-Changing Power of Alternative Energy by Jeremy Shere. Copyright (c) 2013 by Jeremy Shere and reprinted by permission of St. Martin's Press.